Quality fluctuation has a major negative effect on perceptive video quality. Many recent video quality smoothing works target on constant distortion (i.e., constant PSNR) throughout the whole coded video sequence. In , a target distortion was set up for each frame based on a hypothesis that maintaining constant distortion over frames would boast video quality smoothing and extensive experiments showed the constant-distortion bit allocation (CDBA) scheme significantly outperforms the popular constant bit allocation (CBA) scheme and Xie et al’s recent work [2, 3] in terms of delivered video quality. But during the scene changes, it has been observed that the picture energy often dramatically changes. Maintaining constant PSNR would result in dramatically different SNR performance and translate into dramatically different perceptive effects. Although computationally more complex, SNR represents a more objective measure than PSNR in assessing video quality. 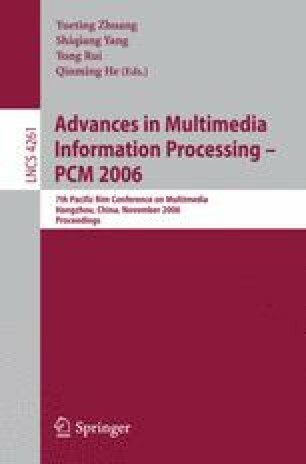 In this paper, a single-pass frame-level constant-SNR bit allocation scheme (CSNRBA) is developed for video quality smoothing throughout the video sequence. To achieve constant-SNR, a power series weighted actual SNR average of previous coded frames is adopted as the target SNR for the current frame. From the target SNR, the target distortion for the current frame is calculated. Then according to the analytic close-form D-Q model and the linear rate control algorithm, the bit budget for the current frame can be estimated. Experimental results show that the proposed CSNRBA scheme provides much smoother video quality and achieve much better subjective video quality in terms of natural color, sharp objects and silhouette significantly on all testing video sequences than both CBA and CDBA schemes.